Creating happier, healthier and better connected residents. “Creative Homes ran group sessions with families to transform the entrance to Ira Court and children can now walk in and out of their homes proud of the change they have made”. Hi, please take a moment to download our Housing Information Pack by subscribing to our quarterly newsletter. Thanks! The home is one of the primary influences on a child’s development in their early years. 25% of children in London live in overcrowded conditions, rising to 43% in the social rented sector. Living on low income can put a strain on parenting and family relationships and there is a need to prevent young children developing public health issues such as obesity, dental issues or personal care challenges when they start school. This start in life can manifest itself well into adult life – poor health, low attainment leading to unemployment and anti-social behaviour. As our families build stronger social networks and confidence through pathways to health and children’s services, the financial responsibility on social housing is reduced through cross-sector provision. In the future we expect to see the short term impacts of Creative Homes support long term missions of the social housing and health sectors – to reduce anti-social behaviour, reduce rent arrears, reduce repairs and accidents in the home, reduce stress through creating happier, healthier and better connected residents. We take a playful and positive approach to helping families identify and overcome challenges in their daily lives where we can achieve the greatest impact – at home. Our Hub to Home programme builds relationships with 30-50 families through door knocking and playful activities delivered on the doorstep. 12 weeks of group ‘hub’ activity help families connect and support each other on a local level to strengthen communities and our pathways programme supports them to have healthier relationships with the services around them. 12 families receive home consultations and 10 families receive the 5 visit home experience. 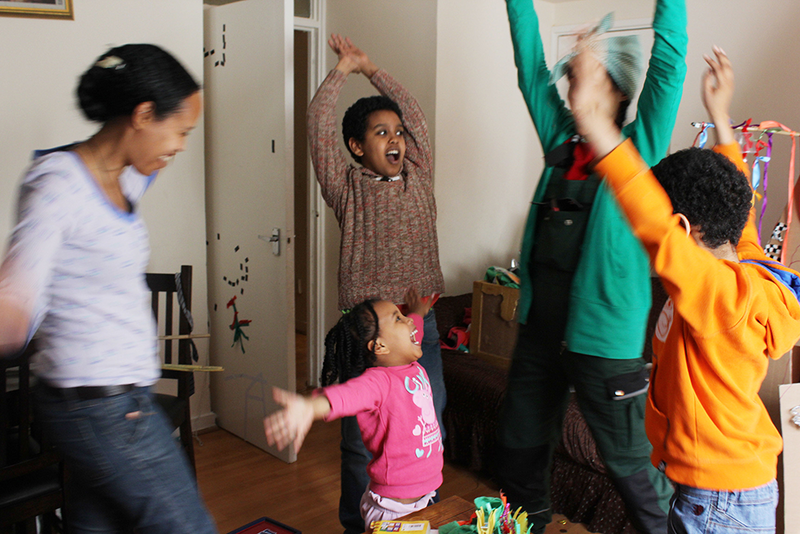 Our home experience consists of 5 visits: a play consultation, 2 live artist visits, a follow up and a pathway session. Through consultation we co-design to tackle daily stress head on by tailoring our live artist experiences. These are designed to meet the needs of to meet the needs of a growing family such as mess and clutter, overcrowding and feeling isolated. We also tackle health issues such as toilet training, toothbrushing and fussy eating, attachment and connection as a family. Tanice has two twin boys aged 18 months. She is struggling to adjust to family life in London having recently moved from Jamaica to join her husband. Her sons demand all her attention, especially Aldane who is very clingy. She is struggling to settle, feels isolated from her community and finds it difficult to play with both of her sons together. Life is stressful. 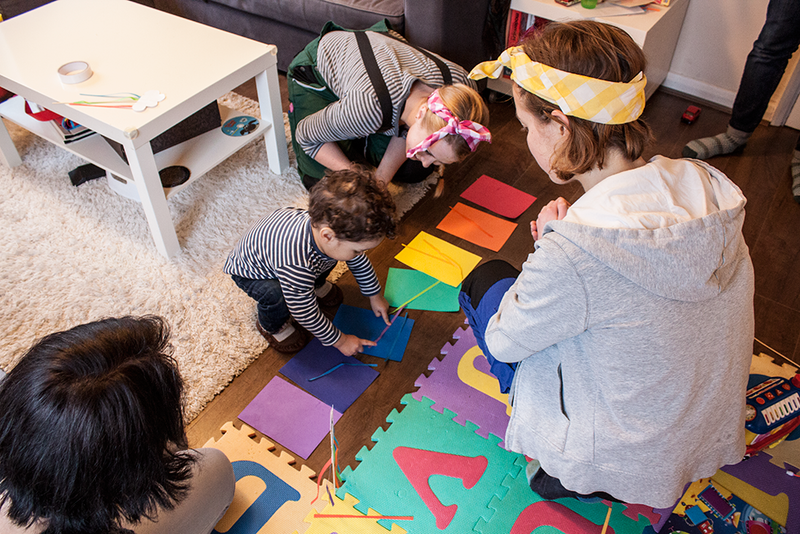 The family meets Creative Homes when an artist knocks on the door, delivering a “fun-to-do-at-home” activity. They then attend our group hub sessions regularly. Next… they get a visit from… the Play Inspector! 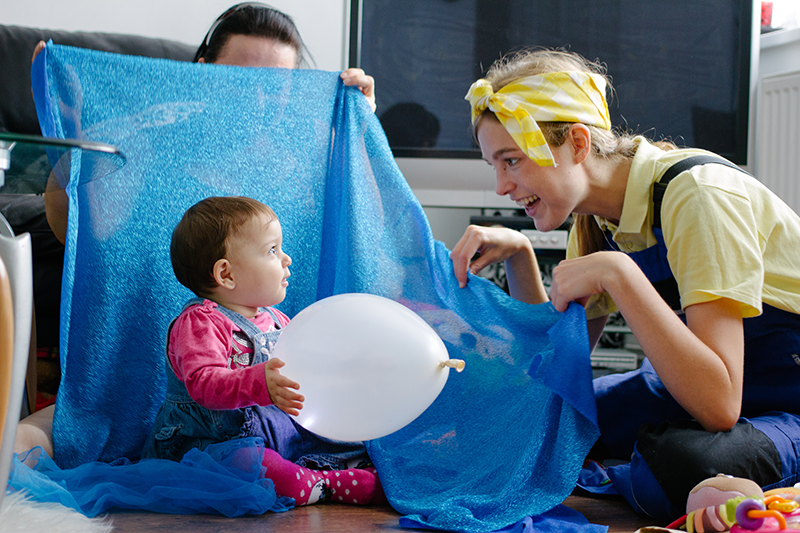 Through interactive songs and playful solutions the family work with our artist to establish a regular routine of creative play at home. By regularly attending Creative Homes group hub sessions the family build the confidence to visit some local services for further support with health and play including their children’s centre, the library, one o’clock club, park and summer festival. “We never really went up to the local garden on our estate before you showed us. But now we go almost every day. They explore the plants and sing the songs you taught them. We stay at least half an hour most days”. Before we say goodbye to the family we link them to their housing organisation’s in-house services for further support with finding employment. “I’m looking forward to a good future. Before I was stressed and I didn’t know what was happening around here but since I met you I feel a lot more connected to my community”. Creative Homes have done some excellent work with our residents on Church Manor estate, helping them to identify and overcome the challenges of everyday home life. Their creative approach has a big impact on reducing stress in the home, supporting family routines and connecting families to health, cultural and support services in their local area.